I make a homemade costume every year for Halloween. This year, I decided I wanted to try to make a really epic costume that no one else would be wearing. I love building stuff, and I also love electronics, and things that light up. I wanted to create a unique costume that incorporated everything in one. My mom and I researched ideas online, and I decided on a homemade vending machine, because it had so many cool possibilites. I wanted to make a more awesome version than what I saw online. I wanted it to be realistic, but also have it be amusing. 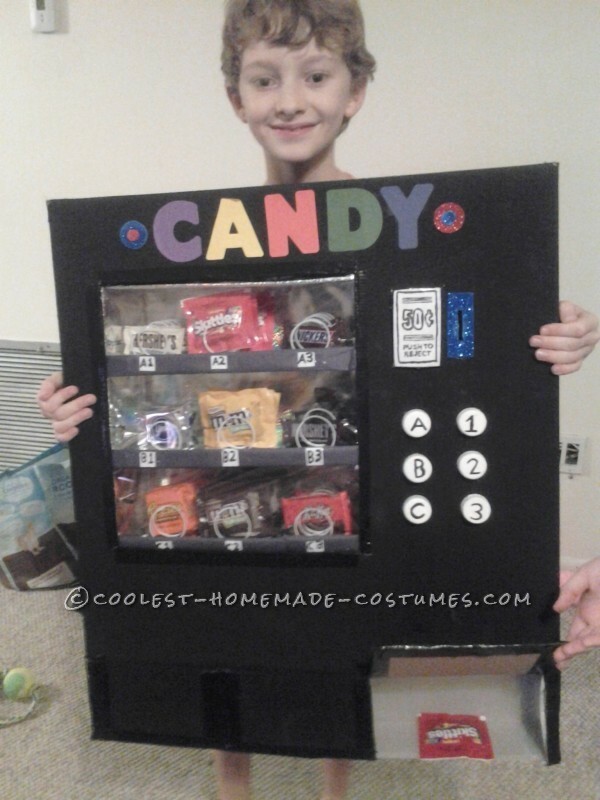 I knew I wanted it to actually dispense candy, and finding a way to do that would be my biggest challenge. We have some rules about homemade costumes in my home. They have to be unique (something you can’t buy in a store), inexpensive to make, and we have to use recycled materials whenever we can. It also has to be able to stay together at least through trick or treating! It was kind of hard to figure out what we needed, right down to the size of the candy bars we should buy, after all, the costume had to fit me, get through doorways so I could ring door bells, and also not be too heavy. My mom was smart and let me hold 2 boxes of full size candy bars, and I couldn’t believe how heavy they were….so we decided to go with snack size bars….much lighter. We also made quite a few trips to the dollar store, a costume makers paradise! We started with two cardboard boxes, a large one, and then a smaller extra sturdy box for the candy shelves, so they wouldn’t sag from the weight of the candy. we lined the inside of the candy shelves with shiny, silver, halographic wrapping paper and added battery powered white mini lights (that I had from last year’s costume) to give it a sleek look, and add a wow factor. We cut up a few plastic, silver dollar store slinkies to represent the springs that spin in a real machine to dispense the candy. We gave each candy a letter and number on the shelf, covered the shelf unit in heavy plastic to make it look like glass, and also, to keep the candy from getting damaged or falling out. Next, we spent alot of time planning how to cut the box , so that it would be just right for all the things it needed to do. 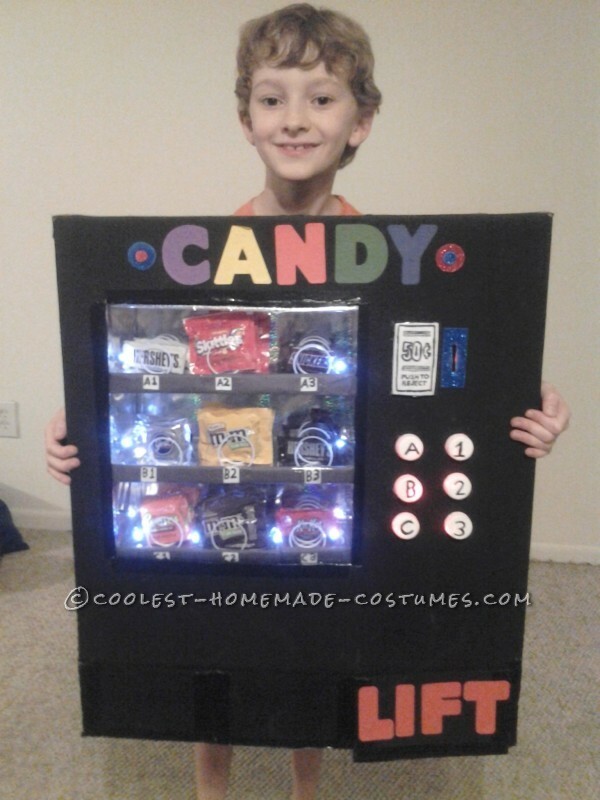 We then cut out holes for my head, my arms, for the candy shelves, a slot for the coin box, a hole so I could turn the lights on and off, and a slit at the bottom for the dispensing tray. Then, we painted the box with black acrylic paint, and sealed the seams, and the cut edges with black duct tape from the dollar store. The hardest part was finding a way to hold the candy shelves in place. so they wouldn’t fall. we had to build a wall inside the costume to support the shelves, yet leave enough room for me to fit behind it, and still be able to use my arms for the lights and to send the candy to the dispenser….that was another tricky problem to solve. We ultimately decided it would be best to tape a big bag to the inside wall, which would hold all the different candy bars, and I could just reach in for the person’s candy choice, and send it to the dispenser. We then had to duct tape all the parts in securely….that took alot of dollar store duct tape…about 3 rolls! After that, we hot glued some selection buttons on the front (plastic bottle caps) and made slits behind them in the box top to make the buttons light up and we secured the lights with tape. We did the same for the coin slot. The last thing we did was cut a plastic dollar store tray to size and secure it to the box with duct tape, and made sure that the flap for the opening opened and closed easily. All in all, the costume was challenging, and took about 15 hours to build. This definitely would have been alot easier to build, and would have taken less time if I had directions like these! I wore this costume to a Halloween party, and evryone went crazy, and couldn’t stop talking about how creative it was! And just about the same thing happened when I went trick or treating! One man, was so funny, and said, “you already have enough candy, get outta here”, another man said, “I’ll trade you one of these for one of yours”. Everywhere I walked, people were stopping to look at me, take pictures with me, and compliment my creativity. I think I made alot of people appreciate homemade costumes that night, because I got tons more candy than anyone else! Great job, as usual, Leo! Wow! I am always amazed at the ideas you come up with! Glad to help you pull it all together…one of our annual traditions. Love you, Buddy!